The Australian Tapestry Workshop presents its Artist-in-Residence exhibition, featuring the work of 15 artists who participated in residencies in 2016, including Sera Waters! This towel, Fashioning Locals, is from a larger series of towels, each telling passed along tales from Australia’s settler colonial and domestic histories. Though towels are often dismissed as innocuous, they have intimate relationships with their owners. They dry bodies, offer warmth and protection, wipe away dirt and soak up spills, and are subject to regimes of homely repetitive care … often for decades. They witness all kinds of goings on, and sometimes even get passed along family lines. The towels of this series are all pre-loved, have somewhat faded patterns, and are marked and worn from such exposure. Home-based textiles, including towels and embroidery, have often had a penchant for translating nature (from outside) into comforting, decorative and idealised versions to live with inside. The embroidery and textile collage upon this towel weaves a not-so-comforting story around the part my ancestor played in domesticating her surroundings, in a specific time and region in our history. In a plethora of palm pattern she stands proudly, not wearing a fashionable fox fur, but sporting a Toolache wallaby, a now extinct species which inhabited the south east of South Australia. I use needlework to recognise and question intergenerational legacies and I push traditions into discomfiting territories with an aim of shifting trajectories. Exhibition opens Tuesday, May 16 from 6 to 8pm, and runs from May 17 to July 7. 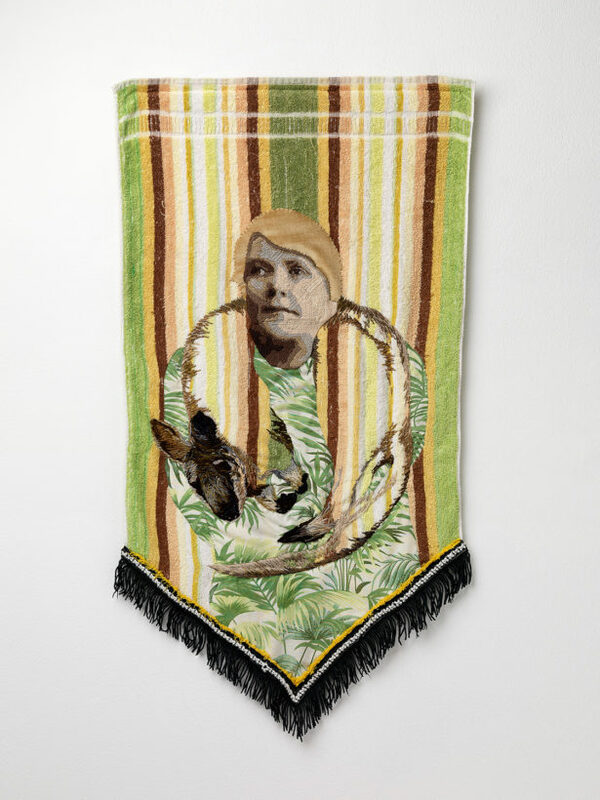 Image: Sera Waters, Telling Tales on Terry Towelling: Fashioning Locals, 2016-2017, from Domestic Arts, towel, wool, cotton, bedsheet, velvet, and trim, 90 x 50 cm.